Item came faster than expected and works as advertised! Item seems to work fine. Thanks for the fast shipping! Very fast shipping nice product worked perfect! Item as promised, fast shipping. Thank You. Seems to be working this far. ARRIVED EARLY! THANK YOU. THAT WAS FAST! Works exactly the way I wanted it to work. Streamless wifi connection is now possible anywhere in my house. And it's high speed with a gigabit connection. Keep in mind in order to get gigabit speeds, you must have another Moca bonded 2.0 device on the network. Right now, I just have this one and a Moca 2.0 router, so I'm getting half gigabit speeds. But that's good enough. Some people say it needs a reset every so often, I have yet to have to reset it. 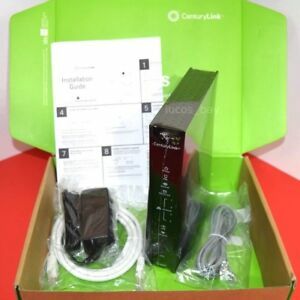 Product works as well as the one received by CenturyLink. This one was scuffed up but I was alerted to that in the initial presentation. So far, so good. Receiving same speed as original modem. We have Verizon Fios service and plugged the WiFi Network Extender into a lan cable that was installed in a weak signal area of our house. The extender works well, the problem has been resolved. This extender offers much better range than the Fios Quantum Gateway Router itself. In my home the Quantum Gateway Router is not in a central location, so its signal at the far side of the house is quite weak. The extender configured itself upon hookup. Now there's a great improvement in the WiFi coverage in my home and this is a much simpler and more elegant solution than the traditional WiFi repeaters I've tried. Great investment. I ordered a replacement router modem combo from another company and it did not work at all I asked this gentleman if this was a good replacement he said yes and he was right he said you may need to load the MAC address didn't even have to do that everything went perfectly fine.